When the term ironman comes up some of things it brings to mind are the triathlon, the tough, durable and world class athletes that take part. You’d expect those same tough qualities from a product with Ironman in its name. The Ironman Triathlon X-Class 510 Indoor Training Cycle certainly seems to have all the hallmarks of a quality spin bike. It looks good, has a heavy flywheel, a solid construction, a console for tracking performance and more. see if it delivers on the promise of the name and the expectations it brings of being able to test yourself to your limit on the bike if you want to. As well as see if it provides great way to exercise for people who may want to take it a little easier for general fitness, weight loss and health reasons. There is much to look at with this bike with some very interesting extras that come with it. First let’s see how it measures up to handling tough workouts. It is made from heavy duty steel to support the most intense workouts. The bike doesn’t flex or rock when set up correctly with everything tightened up. There are no concerns about falling off even when standing up or moving from seated to standing and back again. 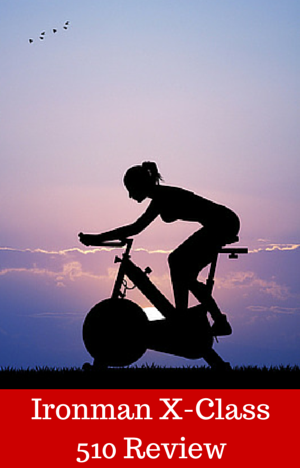 You can just concentrate on your pedaling and getting in your spinning or training workout. To prevent rocking on an uneven floor the bike has adjustable feet at the back that level the bike out. The flywheel weighs in at 44 lbs and is balanced to ensures there is no choppiness or jerkiness to riding motion that you sometimes get with lighter flywheels. It makes for a riding motion that is similar to the one you get on an outdoor bike. The bike has just been released so it might be too soon to determine how it will stand up to years or regular use but it appears that it has been built to be durable and be an enduring piece of cardio equipment. The bike is fully adjustable for a variety of different shapes and sizes between 5ft and 6 4 ins tall. The seat and handlebars can be adjusted vertically and horizontally to get the most comfortable and efficient fit which help you to get the best workout plus reduce the chance of injury. The adjustments are easy and quick to do which makes it possible for a number of people to use the bike – as the last thing you want to be doing when you are ready to train is spending a lot of time adjusting the bike. No one wants to be messing about when they are trying to fit in a workout before work. The adjustments are done by loosening the levers/knobs on the adjustment poles, then moving them into position and then tightening up the levers/knobs. They do need to be tightened up fully to ensure there is no shaking when using the bike at high pedaling speeds. Resistance for doing hill climb type work, to build endurance and strength, is applied by turning the tension knob at the top of the frame. It pushes the fabric pad that sits on top of the flywheel down on to it harder using friction to make it harder to push against or less depending on the direction it is turned. The resistance applied is consistent and constant. It goes from easy to extremely hard in the increments so you can get a wide range of difficulty. There is none of the going from easy to impossible with one small turn. As it uses a pad to apply resistance there will be a little noise given off as the wheel moves past it. It’s not loud but you can hear it but it unlikely to disturb you and when you are breathing hard you’ll be hard pressed to hear it at all. The pedals are connected to the flywheel with a belt drive. This gives a quiet and smooth feel. It will feel different to an outdoor bike as you don’t have a chain moving over the sprockets. The belt drive doesn’t slip or need tightening, you can just get busy pedaling. It doesn’t require the maintenance that you get with a chain drive. However, at some stage in a few years time the belt is going to stretch and it will need replacing at that point. The Ironman Triathlon X-Class 510 Indoor Training Cycle comes with hybrid or dual pedals with toe clips and straps on one side and clipless pedals on the other side. The toe clips will fit athletic shoes and you tighten up the straps so you get a good grip on the pedal for pushing and pulling through the pedaling cycle. The clipless side of the pedals are Wellgo clipless pedals and will fit shoes with cleats. The bike has a fixed gear so you can’t coast – while the flywheel is turning so are the pedals. The Q factor of the bike is wider than a standard bike and you may feel uncomfortable if you are used to riding an outdoor bike. If you are concerned about this and the possibility of an unnatural feel and injury the best spin bike for Q factor in the Spinner NXT but is doesn’t come with a console and has a chain drive. It is durable and solid and can be relied on to give an intense training or spinning workout. Handlebars. The handlebars are covered with non-slip grip rubber type coating. It stops your hands slipping and blisters forming when your hand get wet from sweat. There are multi-grip options so you can alter your grip depending on the exercise you are doing. In addition it comes with elbow pads to cushion your elbows when doing Aero position training – it will prevent them getting sore as happens when you rest them on the handlebars. Seat. This is a padded seat with air chambers that should help to absorb weight and movement to prevent too much uncomfortable pressure on the sit bones. Having said that you may still find it uncomfortable due to everyone have different tastes when it comes to sitting on a bike. If you are new to biking or spinning you may consider changing the seat for a more comfortable bike seat or you could try a gel seat cover or padded bike shorts. Dust and Dirt. The bike is going to drop a little lubricant from time to time and the resistance pad will give off dust particles as it wears down. Depending on how hard you push yourself you may drop sweat on the floor. Fortunately the PVC mat included will catch these things as they drop and prevent your floor being damaged. Noise. It is a quiet bike with the belt drive not making much noise at all. The resistance pad will make some noise but not enough so that you have to turn the TV up or shout to have a conversation. It is unlikely that anyone in the next room will hear the bike so you can probably workout in the middle of the night and not disturb the others in your home. The only bikes that are quieter come with magnetic resistance, with the Keiser M3 Plus being the best rated bike with magnetic resistance but it has a lighter flywheel and the console doesn’t come with an App for tracking progress. This bike does not have the smallest footprint for a spin bike but it is still compact and won’t take up too much room when storing it out of the way. It is 26 ins wide by 44 ins long so it could be stored in a large cupboard, under the stairs or by a wall out of the way so you can have your living space back for the rest of your life. As it weighs 127 lbs it has 2 transport wheels on the front stabilizer that you tip the bike onto, to take most of the weight for you. Although they handle most of the weight you still need to be careful not to overbalance. It seems to be okay on carpet as well as hard surfaces, but I think on deeper pile the wheels may get jammed due to being partly covered. On wooden floors it is worth checking that they don’t scratch or damage it when moving the bike. The bike arrives partially assembled for delivery purposes. The steps left to complete the assembly should only take only 30 to 60 minutes at the most. Everything needed to assemble the bike comes with the bike including the tools. The instruction manual included is easy to follow. If you want you can check out their assembly videos online or download the WeAssist app to get to see all the steps out in front of you. It involves adding the stabilizer bars to the bottom of the bike, the pedals, console and wires to the handlebars and bike, the handlebars to adjustment pole and the seat to its adjustment slider. The adding of the console does involve plugging in wires to the bike and the console itself but it is laid out simply and doesn’t present any issues as there is no feeding wires down tubes etc. In fact the only real issue may be the weight of the bike especially when adding the stabilizer bars to the bike. It will probably make it easier and safer it there are 2 of you for this step, but it can be done by 1 person you just need to be careful to prevent damaging the bike or yourself. One of the best features of this bike compared to other bikes with consoles is that you can upload the information to a fitness account using bluetooth and it has an App as well. You can use the App to monitor your individual workouts and use the account to track progress, set goals and set up reminders giving you a powerful way to stay motivated and on track. You don’t have to use the bluetooth or the App if you don’t want and can use the console on its’ own. It is a basic console that measures RPM, time elapsed, calories burned, speed and when wearing the heart rate strap your heart rate. In the center is the LCD display just below the low battery and bluetooth indicatosr. The numbers are easy to read while you are pedaling. Below the display are the buttons for programming your workout. The up and down and mode buttons allows you to set targets for your workout. Next to them is a reset button to reboot the console. To right of that is the bluetooth button for connecting to your devices running Android 2.2 or iOS 7.1 or later. It is this connection to an App along with the mycloud fitness account that sets it apart. When you’ve paired it with your phone or tablet you can make all the settings on that device you want for your workout and see how you are getting on. You can track your progress towards your fitness and weight goals as you can enter information manually concerning your weight and your goals. With the App you can share your results on Facebook if you want. It can give you exercise log reports, weight log reports by day, by week, by month and by year. With the cloud account you can, with the addition of other information input manually, monitor BMI, heart rate information, fine tune and set up your own fitness program. It can be set up to send you alerts to let you know when you’ve reached certain goals so you can reward yourself. It needs 4 AA batteries to operate and these are included. At the top of the console there is a low battery indicator that turns red when they need replacing. The console goes into sleep mode when pedaling has stopped for 4 minutes giving you time to get off the bike and return if you need to take a short break. A big plus for this bike is that it comes with accessories over and above a the standard water bottle holder. It has one of those too on the handlebar. it is in easy reach but it seems rather small and requires placing in which can be a little awkward when you are pedaling. Secondly it comes with a PVC exercise mat that you place under the bike to prevent damaging the floor from sweat and so on dropping on it as well as preventing scratches if the bike moves. Third, it comes with a place where you can place your table or smartphone – it rests on the console which makes it easy to see when you have it synced up with your console and are using to monitor your performance. If you’re not doing that a tablet will cover up the display and you won’t be able to see how you are getting on. Fourthly, it includes a heart rate strap that you use in conjunction with your console for monitoring your heart rate to keep it with the optimum heart rate zone. Lastly is the elbow pads for resting your arms on when leaning on the handlebars which can save a lot of pain if you plan on doing this for long periods of time when sprinting and hill climbs in the aero position. As this is a newly released bike there aren’t many customer reviews but the people that have left one rate the bike highly and are very enthusiastic in their praise of it. The reviews compare it favorably with the best bikes you see in clubs. They like the smooth ride, the console and the feedback it gives using the App. The only minor complaint relates specifically to the individual and even they weren’t that bothered by it because they have a short torso they needed to stand on the pedals to operate the console which they find with other bikes. The bike includes a lot of very good features over and above the expected ones of being durable, solid and being able to get intense workouts. These feature are a console that you monitor performance and upload that information to your fitness account to keep track over time, belt drive, dual pedals, a PVC mat and somewhere to put your tablet (not many bikes do this especially at this price). When I was checking price there did not seem to be a discount but at Amazon the bike qualified for free delivery and Prime making for a good deal overall but this does change. This bike gives you the basis you need for training and workouts as tough as you want. The bike is solid and durable as you’d expect. It can be adjusted to fit you properly and others in your household quickly and easily. It has a number of features that make it stand out – the App, the fitness account, the dual pedals, the belt drive – that all combine to make it something more than you usually get with spin bikes even at this price. If you are a beginner or a casual exerciser then this bike can do the job but maybe more than you want to pay and you are more likely better served with one of the bike we discuss in our spin bikes for beginners for beginners. This is an excellent choice for those wanting to take their training seriously, to push themselves and achieve their fitness goals – whether they are training for a triathlon or other events or just wanting to get fitter and healthier.